After this experience, I will always “Look Inside” before I download a book. I want to see if the author has a clue about ebook publishing and if I can bear to read the prospective purchase in the format provided. I also would love to have my money back for this Kindle book buy. It was billed as a “mystery suspense thriller” and I couldn’t resist the title by an author I’d never read before. 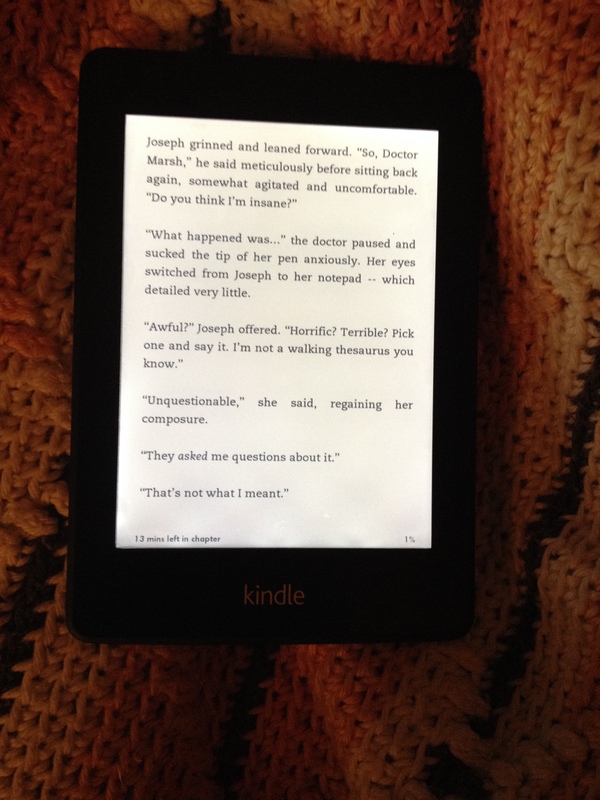 I downloaded the book, opened it in my Kindle and started reading. The layout of paragraphs immediately alarmed me. I actually like that style for a blog, but not a novel. Each paragraph stands out in a blog but it’s too much for a lengthy read. I use it here. But in a novel I want the paragraphs indented and no space after each one. I thought maybe it would stop after the first chapter, just a forward for the novel. But no, it went on. I scanned ahead but stopped reading. If I chose to go on, I’d have to tap my Kindle to turn the page more often than I was willing to do to make it through this one. I went back to Amazon, found the order and did the “Look Inside.” Sure enough, the Kindle edition shows it in that format. No indents and extra spacing. I clicked the print edition and found it to be proper formatting. I won’t bother to order the book in print. This author has already wasted my money. I love reading on my Kindle and have come across some minor errors in ebooks before, but nothing like a whole book full of bad formatting. So, warning to all readers check out that “Look Inside” feature to see if you can handle the format before you download that next ebook. And authors, whether your self-publishing or have help getting that book out from an established publishing house, please format your precious words so that readers don’t have to struggle to digest them. They might just read past chapter one. Anyone else have issues with ebooks? This entry was posted in Writing and tagged Amazon order, ebooks, Kindle, Look Inside, paragraph format for Kindle, publishing, warning for writers, writing by Lori Ericson. Bookmark the permalink. An informative post. I feel sorry for the author. Writers typically only get one chance with a new reader. You might consider contacting the author and informing them of the problem. Feedback from readers, positive or negative, is helpful to writers, especially new ones. Writers who follow your blog should take note of how a poorly formatted book greatly diminished your reading experience, of what otherwise may be a good story. Lori, I hope you don’t mine me adding the following paragraph in hopes of helping other writers, who follow your blog, who may not know how to format their eBooks. Smashwords Style Guide is free and shows in detail how to properly format an eBook. I use the same WORD file for both Smashwords, Apple iBooks, B&N, Kobo books, and Amazon, except for one line in the book, Smashwords Edition or Kindle Edition. The WORD document can be uploaded to Smashwords. To create the Mobi file for Amazon, save the WORD document in HTML and then use Mobi Pocket Creator to generate the mobi file. The mobi file can then be uploaded to Amazon. That’s a good idea Jim, and thanks for the note on Smashwords! My daughter said she has seen the same problem a number of times on ebooks.